Metal core Printed circuit board is widely used in the production of electronic products because of its advantages, such as flexible design, stable and reliable electric property and excellent economical performance. Metal core PCB (MPCB) is mainly used in various high-power LED project landscape lighting, such as wall washing light, projector light, lawn light, underwater lamp, fountain light, street light, indoor light, 1.2-long LED light, flashlight, LCD, etc. Aluminum base pcb have excellent flame retardant, high mechanical strength, dimensional stability etc. 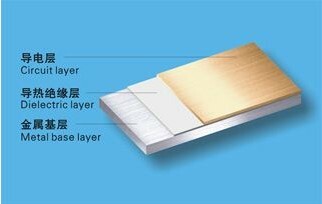 Especially it has very good heat sink, electromagnetic shielding and solder float. It’s widely used for the modifier and sparker on fire for motorcycle and mobile, power LED,sound box, power supply module and acoustics shielding system etc.